Coincidentally, today Karen C on her blog posted Letting the Horse Be in Charge. It starts out: "Just back from a really fantastic ride on Chief." 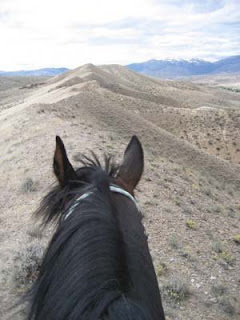 Same here - I was thinking what a great ride I had on Rhett today, and how I let him do his own thing on the trail - I was composing the story in my head as we rode along. Rhett's one of the best endurance horses I've ever been on. I do some days have to gently encourage him to go out on the trail at the beginning - as opposed to staying at home and getting fed treats, or taking me on every shortcut home, just in case I don't know the shortcuts are there - but once he gets into it, he's into it, and I let him choose what he wants to do. I pick the general direction we head out, and he picks the trails around and back home, and the speed he wants to go. Doesn't want to take the trail up that steep hill? OK, he chooses the road and he chooses to canter along it. He wants to take the hilly, winding Dog Trail back home? OK, he rolls to a gallop up every hill, walks down the other side, picks up a trot again when it flattens out, then enjoys tearing around every corner (and I hope we don't meet anybody coming from the other direction!). He usually chooses to slow down to a walk at any downhill, steep or not, and he'll slow down to a walk over rocks. When the trail looks good, or when he just feels like it, he picks it up again. At one spot today, he went from a canter to a gallop to a flat out run. 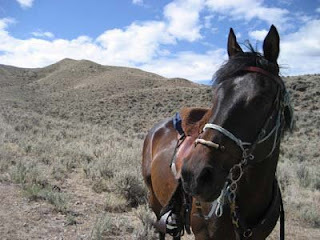 One day we went out on the Rim Trail, and he cantered along a spot he usually does, but he wasn't into working hard that day. We spent most of the rest of the trail along the rim at a walk, only picking up a trot at a few places. 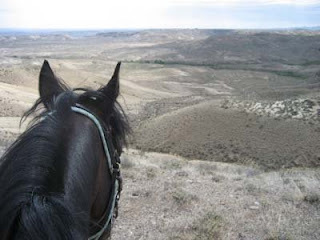 And then he spotted something to his right - 3 horses on the next ridge over, going in the opposite direction. They were like big bugs on the horizon, but I'm sure Rhett knew they were horses, and he was fascinated by them. He wasn't nervous or excited - he just wanted to watch them. We'd stop and stare, then he'd go back to walking along the trail. He'd glance over, keeping tabs on them, then stop and watch for a while again. Once we must have stood there for a full minute. He continued that - walk, stop and look - until they had become just specks over our shoulder, and then finally disappeared. That same day we came over a hill into a wide wash, and there was a coyote on the other side. The coyote stopped to look at us; we stopped to look at him. The coyote decided to keep on moving, and Rhett curiously watched him until he disappeared over a hill. 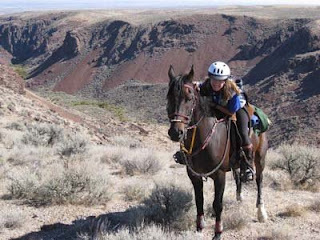 When Steph was training him one year, she took him on the Badlands loop that has a nice mile-long uphill soft stretch with perfect footing. The last time I took this trail with Rhett, he was SO into it, cutting the bottom corner at a canter, shifting to a gallop and working hard all the way to the top. Another spot in the trail was a shorter but steeper uphill, and he just laid it down and sprinted to the top - yeahoo! He just attacked these parts of the trail, and maybe it was partially learned instinct because he was always asked to canter or gallop here, but part of it that day with me was certainly that he ran because he wanted to. I never asked him to exert himself. He might spook once in a while, but not seriously enough to try to get me off - he's playing, and he's so strong and balanced, he makes me look like a decent rider, perching motionlessly over his flying mane as he rips along the trails. I look like I know what I'm doing, but it's all about Rhett knowing what he's doing. how great to have that ... how long did it take you to "trust" him and his speed?